How to put a paper dot in the center. 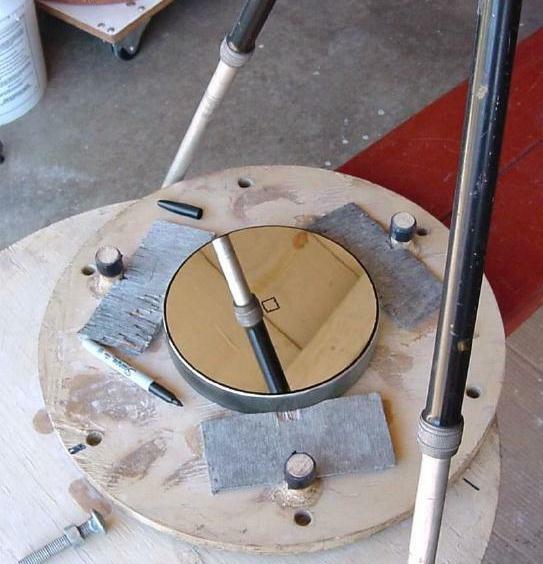 Alignment of your Newtonian Telescope will be aided by marking the center of your primary mirror. The dot will be exactly in the center of the shadow cast by the diagonal mirror. if the mirror needs cleaning at some time in the future. 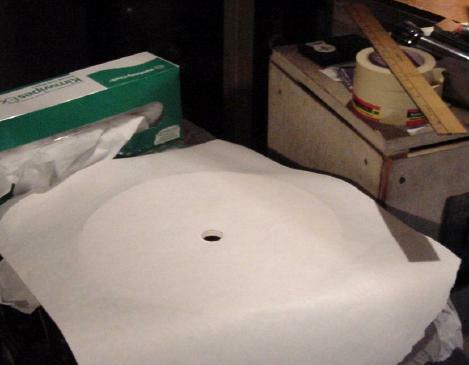 We start with three sheets of clean paper. The first sheet we crease over the mirror edge. The second sheet we put on the table to keep whatever has been on the table from transferring to the first sheet. We cover the mirror to keep the dust off with the third sheet. On the table we have measured from the crease and found the center of the first sheet of paper. We cut a nice round hole in the center. Back at the mirror we align the crease with the mirror edge and stick the dot in place temporarily leaving the edge up so we can adjust it. We check with the ruler and adjust the dot until it is exactly in the center. Once you press the dot down its very hard to move it without damaging the mirror coating. If its not in the center put another dot offset over the first dot. OK, its done. Mr. Dobson has told me the bright dots are easier to see in the dark than black dots. If you are one of those high tech people with a laser collimator you might use one of those three hole binder reinforcement rings. 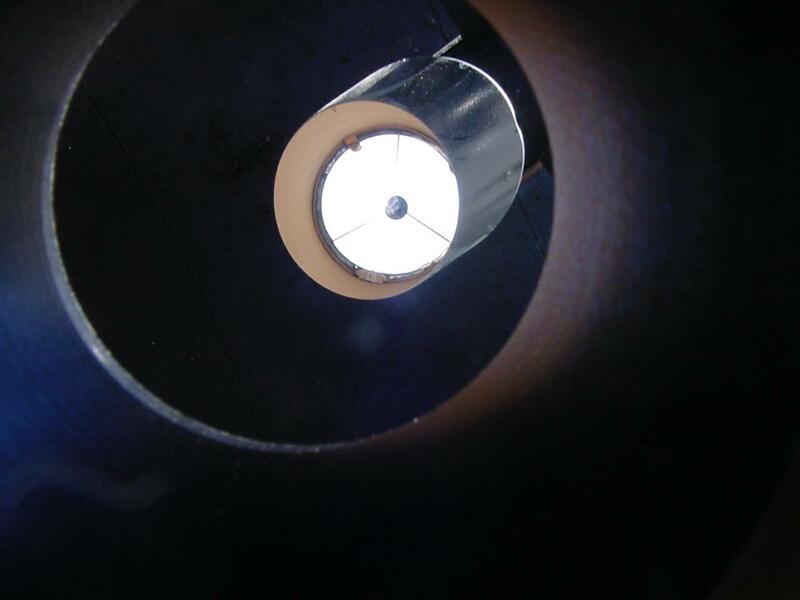 During laser collimation the laser light will strike the center of the mirror, although in use the starlight is blocked by the shadow of the diagonal. 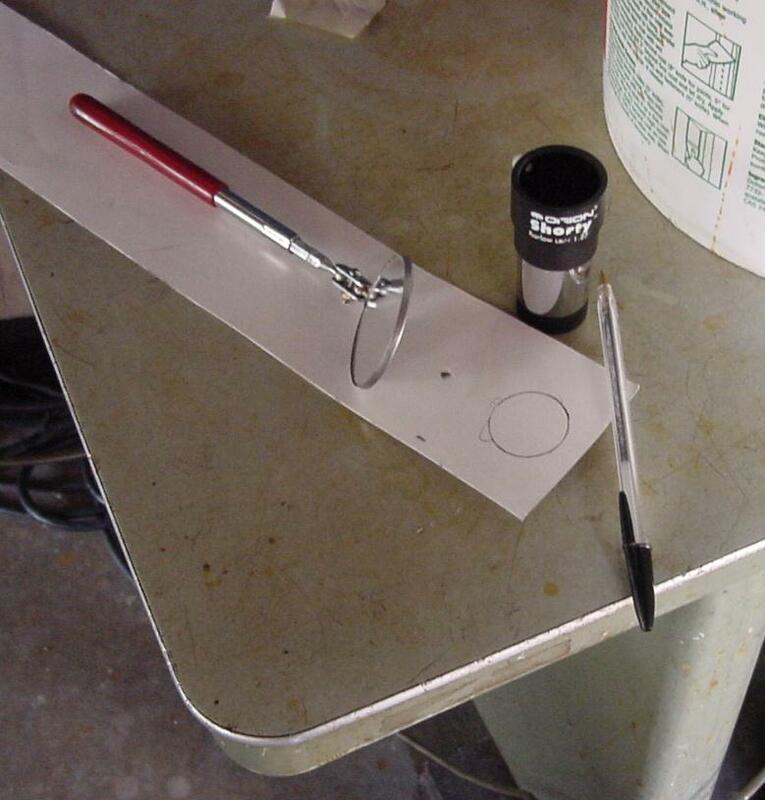 When preparing for a laser collimator I draw a 1/2 inch square or circle on the mirror with a felt marker pen. Marker pen marks usually come off quickly in methanol. Clean the spider webs, deceased pill bugs, dust and other assorted stuff from the tube. When unwrapping the mirror double back the wrapping tape onto itself to avoid accidentally sticking the tape to the mirror. You may think your hands are clean but there is always corrosive oil on your hand. If there is no way to get the mirror in the telescope consider using clean cotton gloves. 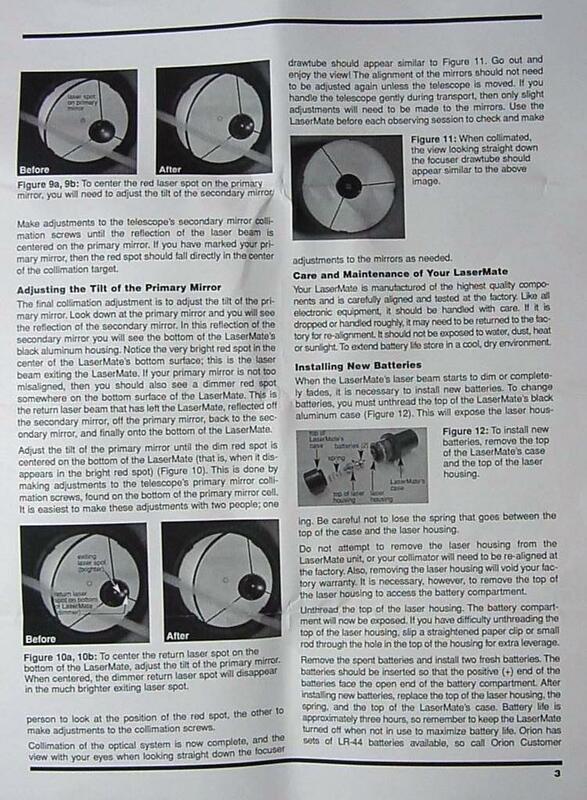 See note below for telescope builders. I prefer using a marking pen to mark the mirror center. 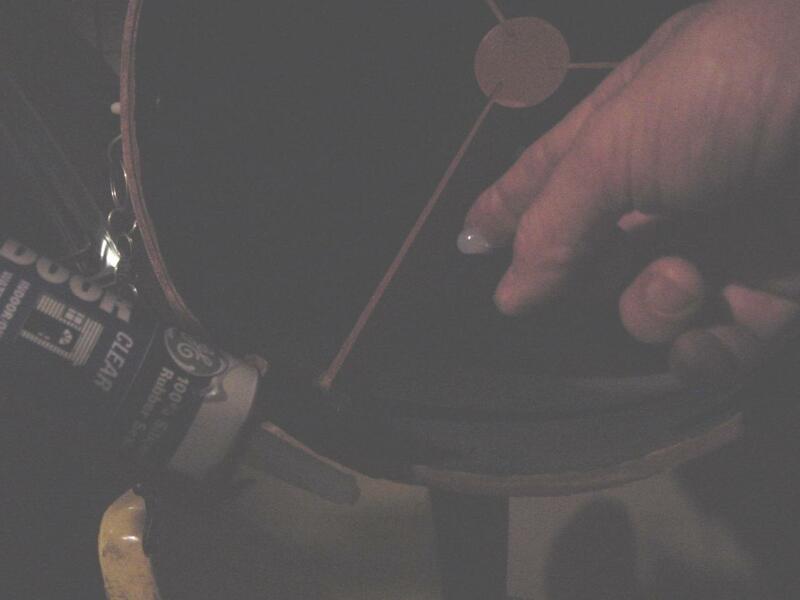 Here I mark the center of an 8 inch mirror. A Kimwipe from the wrapping protects half the mirror from my hand. Home mirror makers sometimes don't finish the outer 1/16 to 1/8 inch of the mirror edge. 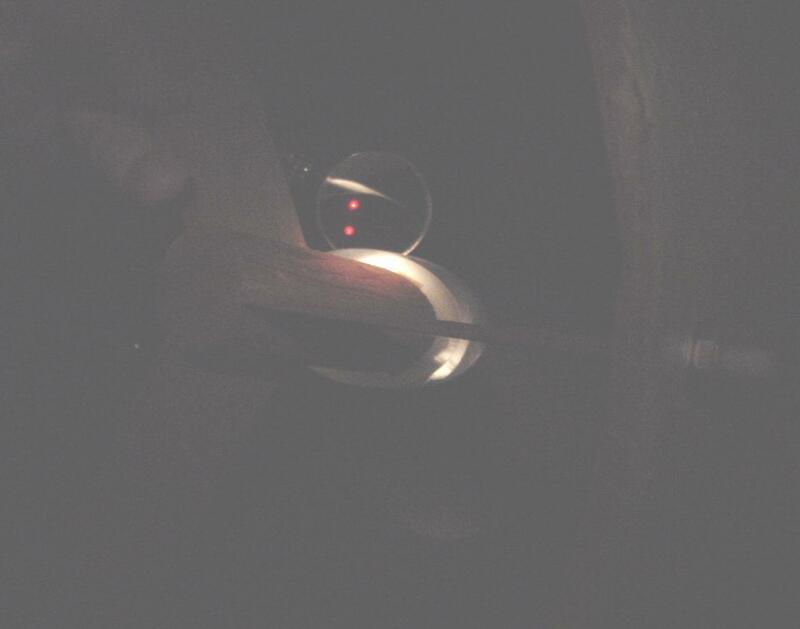 To avoid scattered light from this area I rotate the mirror on a turn table under the marking pen to mask the edge. Only light that will be scattered into the eyepiece field is important. Don't try to paint edge chips or scratches since the light from these areas will almost never strike the secondary mirror. 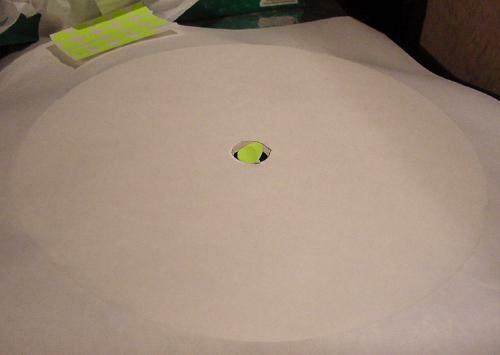 If a turn table is not available buy poster board or matte board from an art supply store and make a circle with a string compass and cut a ring using a box cutter. Whenever the mirror is waiting cover it with a lint free paper towel. These aluminum foil covered pads of sealant were made by placing six nickels in stacks of two onto the plywood backing plate and wrapping the mirror in aluminum foil. 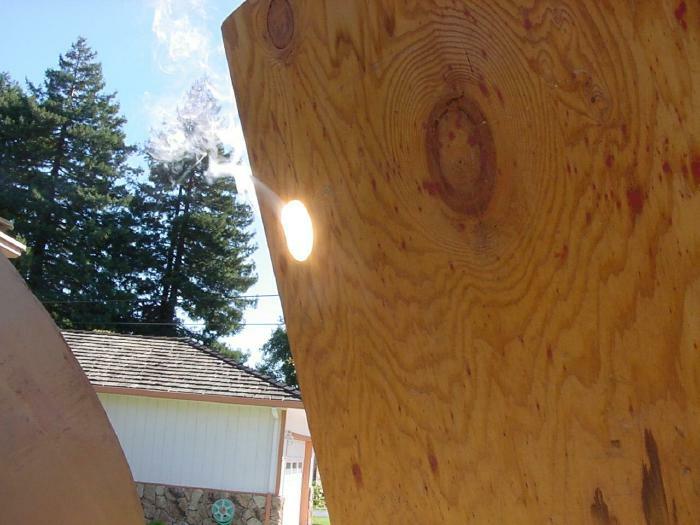 The sealant was placed between the coins on the sanded plywood and the wrapped mirror lowered onto the sealant. This provided a temporary mirror cell used for testing while making the mirror. In this picture I sand away the foil to ready the cell for 'permanent' mirror installation. 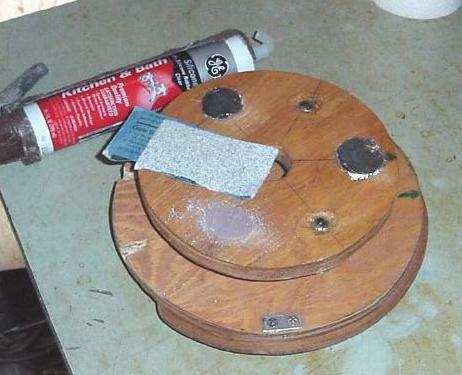 Never glue or epoxy the mirror tight against a backing plate. 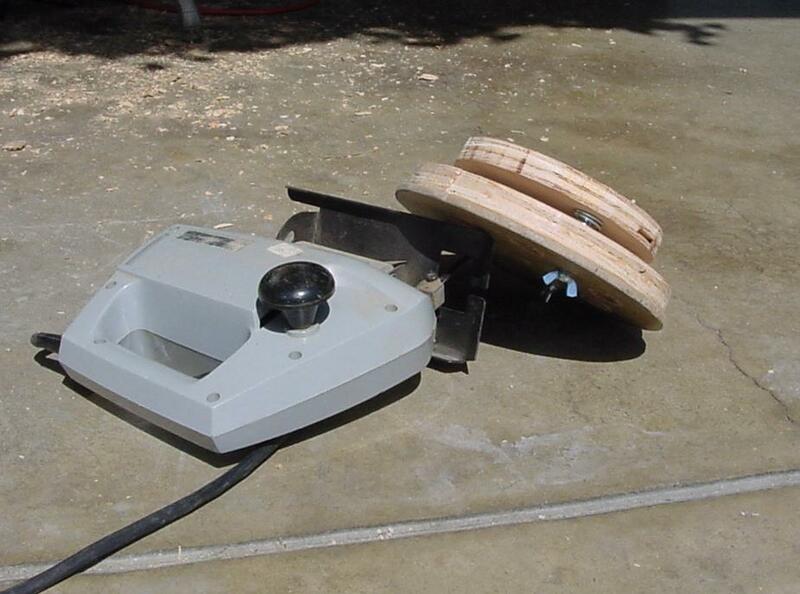 Always leave at least enough space to slip a hack saw blade between the back of the mirror and the backing plate. Sealant dust is almost impossible to remove from the mirror face without damaging the coating. The mirror is lowered onto the sticky sealant. 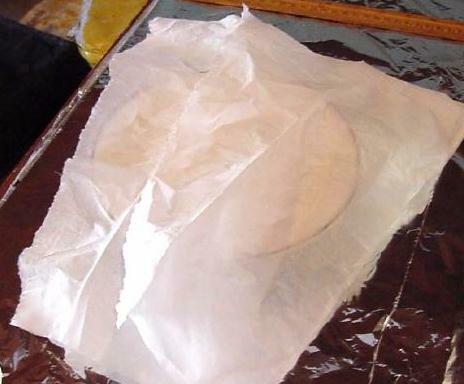 Then the mirror covered with a paper towel or the Kimwipe from the wrapping. Lay an old TV Guide on the Kimwipe to hold it flat. 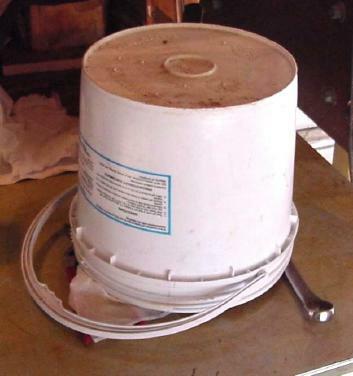 Then I cover the whole thing with an empty bucket. Leave a little space for the air to circulate. After 5 minutes don't touch it again until the next day! Installing the mirror. The next step will be collimation. 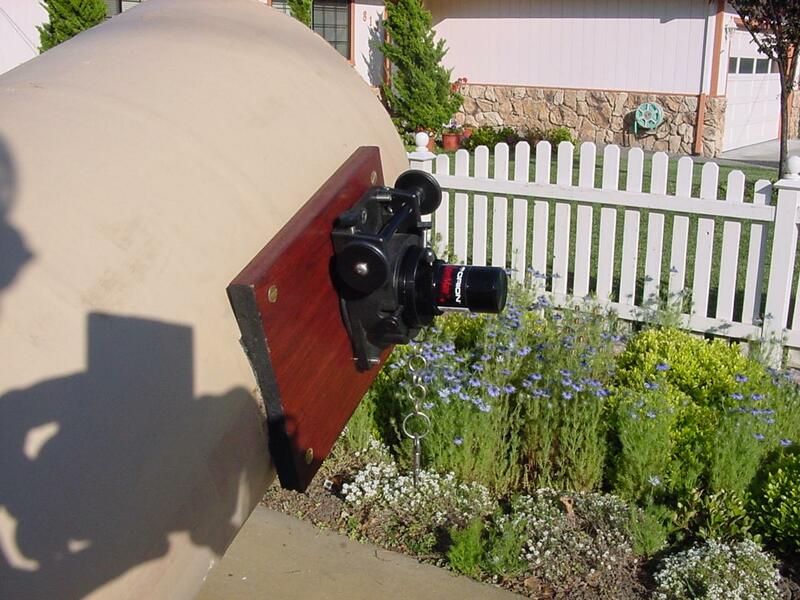 And don't forget the telescope cover. 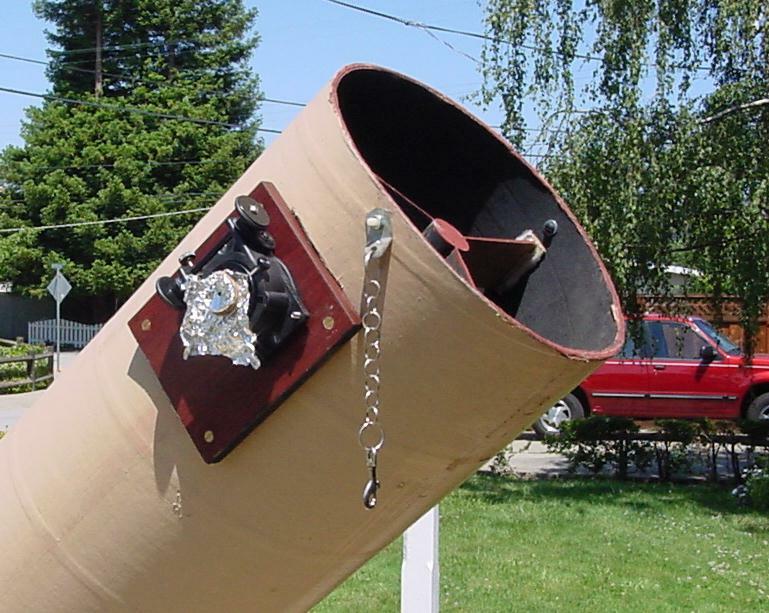 If you have a space problem and it is necessary to store the telescope pointing straight up for a long time then carefully remove the mirror cell and make an aluminum foil cap for the mirror and attach with tape or rubber bands and re install the mirror cell in the scope. 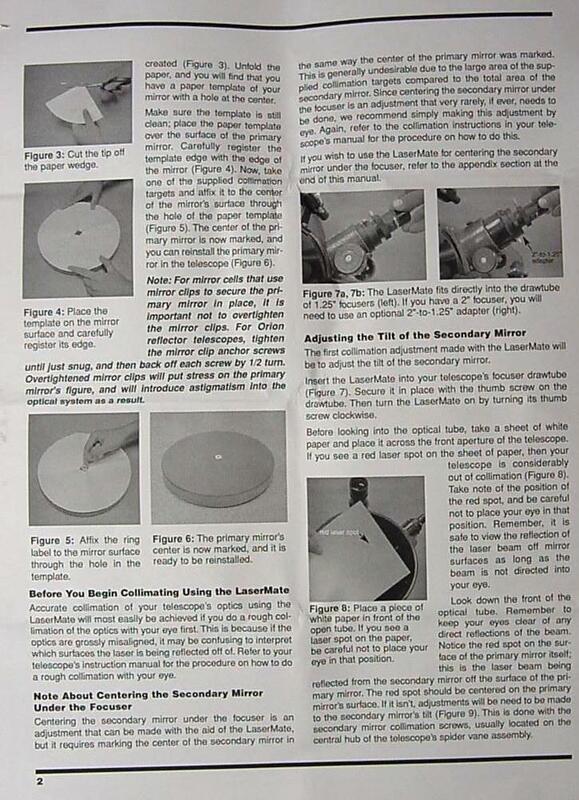 A note for those of you building or planning to build an entire telescope from scratch. lubricating and re-coating of the mirrors. 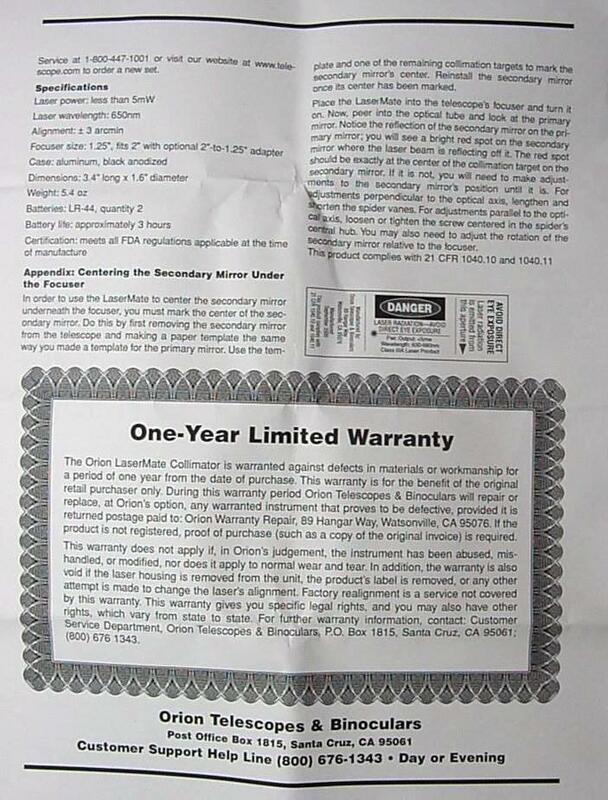 There are some recommendations for telescope builders. 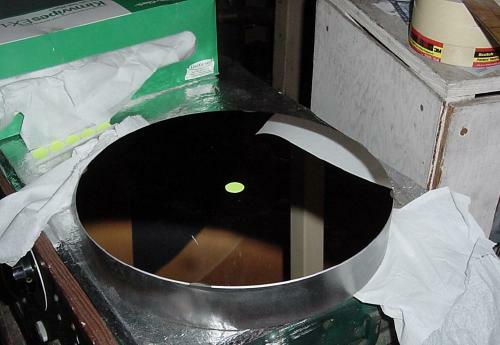 figured mirror without having started work on the telescope. some polish on the mirror and before figuring. 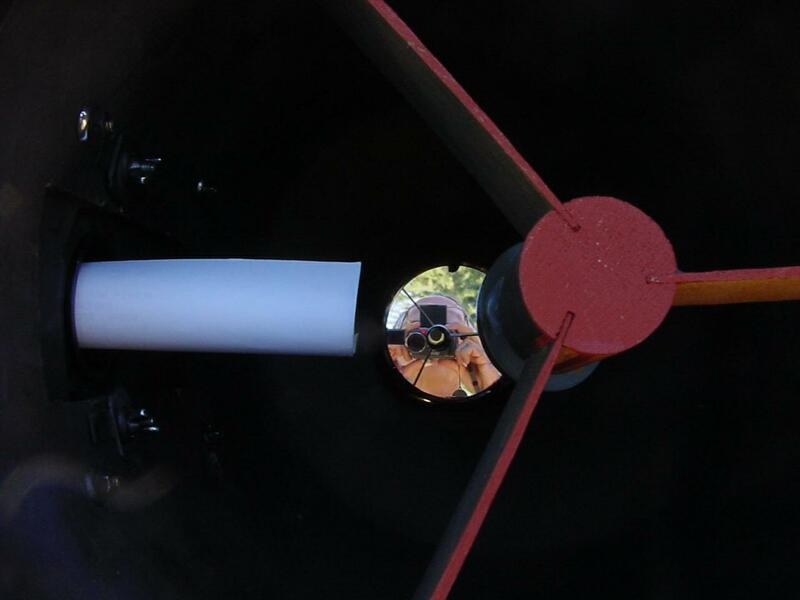 The mirror can be tested on an artificial star while in the telescope. 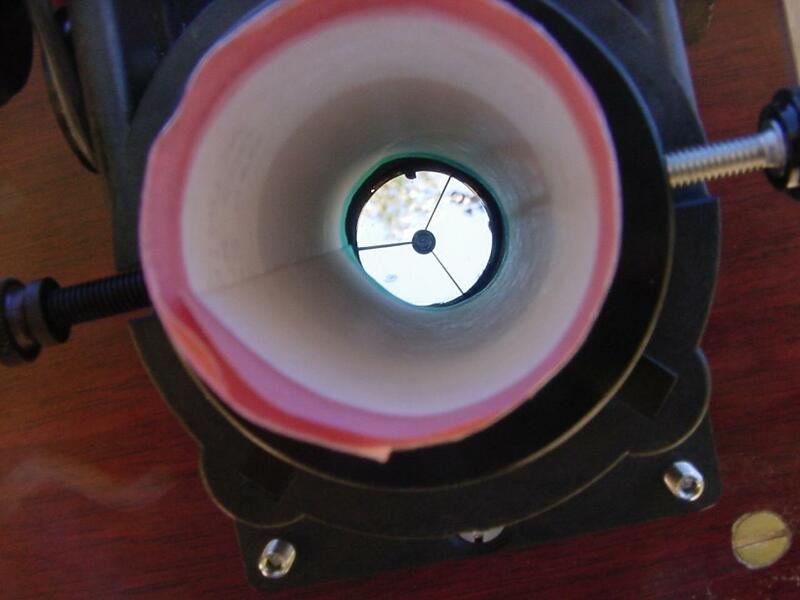 Collimation without any special equipment. As we begin the diagonal is not in front of the eyepiece and the mirror is tipped. If the telescope had been in adjustment last time we used it we would tip the telescope up and tap it on the bottom to seat the mirror on the mirror cell. In the distance can be seen an out of focus image of our favorite power pole insulator. We have taken a sheet of printer paper and painted one edge green and the other edge red. 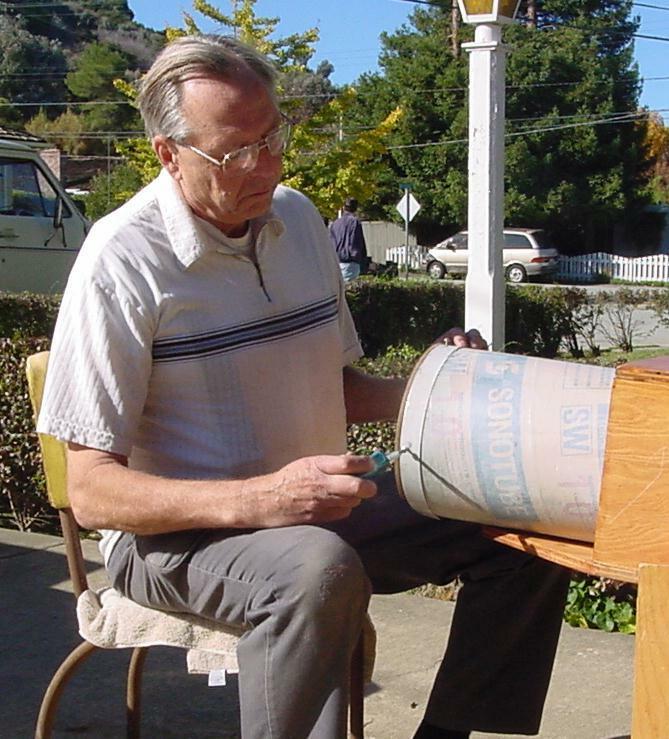 The paper is rolled up and put through the eyepiece tube. If we position our head in the right place there is a green circle concentric inside a red circle. The spider legs were cut the same length to hold the diagonal in the center of the tube. If there is an adjustment for tilting the eyepiece tube we have tilted the eyepiece tube to point at the diagonal. When we work the focus of the eyepiece the paper should always point at the diagonal if we have a good focuser. I'm the guy with the camera. We have adjusted the spider and the mirror cell adjustments. It looks better now. We can't see the whole mirror. Is the diagonal too small? No, our camera is too far out. If you look at the center of the diagonal you can see the camera lens reflected in the diagonal, reflected in the primary and reflected in the diagonal again. At this point the adjustments we make to collimate the telescope are to tip the diagonal north and south or east and west to center the telescope primary mirror inside the red and green circle. On a Dobson spider the spider is rotated in the tube for one adjustment and the spider legs slipped up and down the tube for the other adjustment. Keep in mind that since the diagonal is flat it has no optical center. The diagonal can be tipped at exactly the correct angle and not be in front of the eyepiece tube. Well it looks good now. 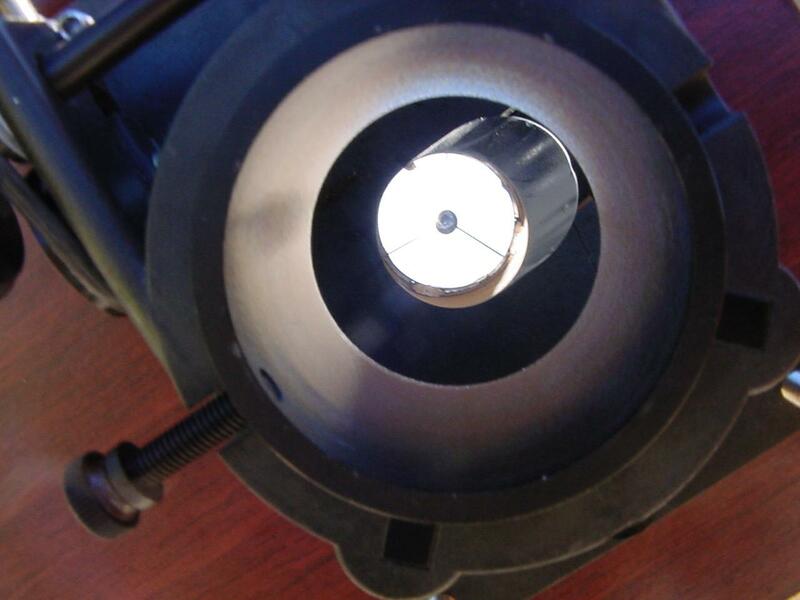 We adjusted the primary adjustment bolts to get the reflection of the diagonal in the center of the primary mirror. This is where we make use of the paper dot. Opps, I didn't adjust anything but it looks out of adjustment again. No its OK, the problem is I'm not looking down the center of the eyepiece tube. To get the good light for our picture we had the telescope pointed nearly towards the sun. This is dangerous. Since the sun is moving we pointed the telescope behind the sun. 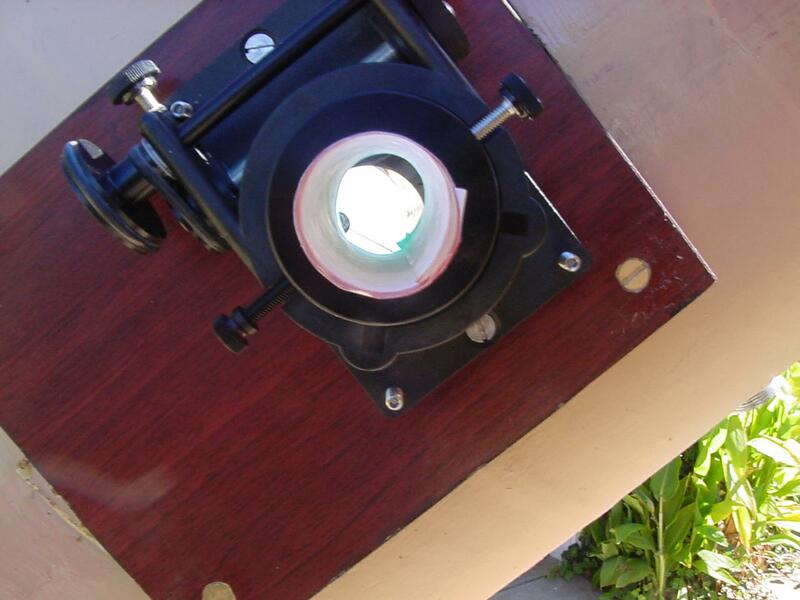 Pointing the telescope toward the sun is not required for telescope collimation. We wrap a piece of aluminum foil over the end of an eyepiece tube and poke a hole in the center of the foil to look through. We can see the primary mirror all the way to the edge. Since we bought a diagonal that is 1/4 inch oversize getting the diagonal in front of the eyepiece tube is easy. position within their range of adjustment. 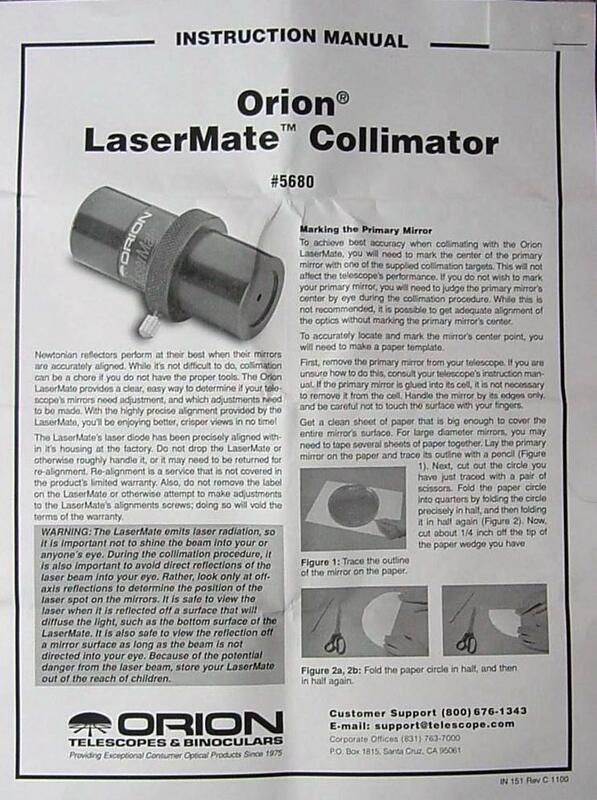 Collimation using the Orion laser collimator. The laser collimator slips in the eyepiece tube just like an eyepiece. We have cut one of our green dots into strips and made a 3/8 inch square on mirror exactly in the mirror center. The laser collimator beam reflects from the diagonal and misses the center of the primary. After reflecting from the primary it misses the secondary but hits one of the spider legs. You might want to hold a piece of paper where you intend to put your eye to make sure the laser beam is not there. We have tilted the diagonal by slipping the spider legs on the inside of the tube until the laser beam strikes the center of the mirror. Next using a mechanics mirror, similar to a dental mirror, we see that there are two red dots of laser light on the face of the diagonal. We are not seeing the direct reflection of the laser. The laser light is so bright we can see light scattered from the diagonal surface. One dot is from light directly from the laser. The other dot is the light reflected from the diagonal and then from the primary mirror. We adjust the primary mirror adjustment bolts until the two dots are one. Then we tack the end of the spider leg to the tube with a bit of silicon sealant. If you don't use too much sealant it is easy to make further adjustments later. Instead of the sealant to retain the spider we now use tensioner springs. Tensioner springs to better retain the spider. And of course just because the angles are correct it doesn't mean the diagonal is centered in front of the eyepiece tube. If its not right slip the spider legs in the tube and then recheck with the laser collimator. 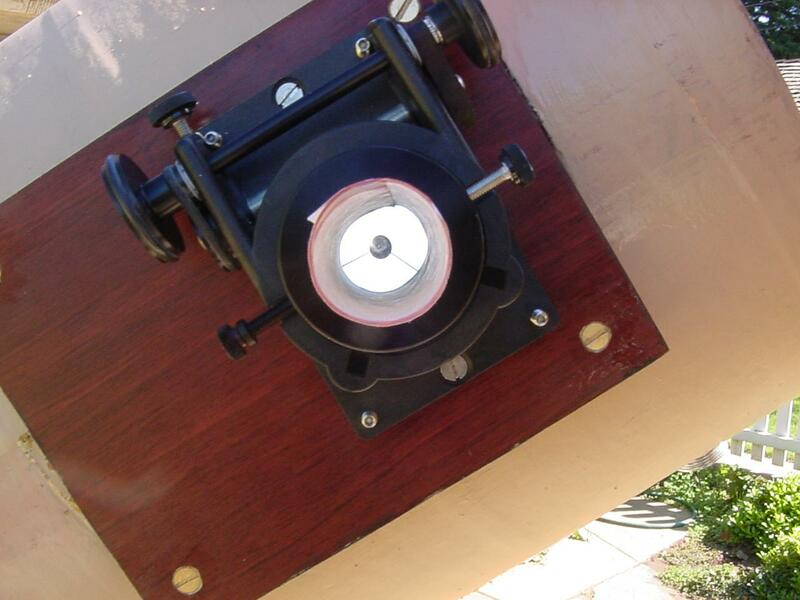 There is another type of laser collimator used to collimate Cassegrain telescopes. It is called a holographic laser collimator. 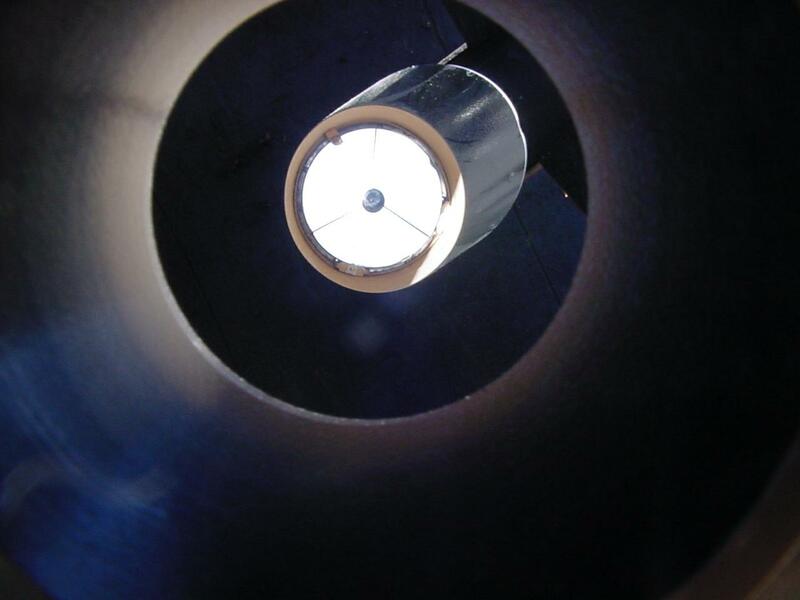 We found the article 'Collimation with a Barlowed Laser' in the January, 2003 issue of Sky and Telescope, page 120. 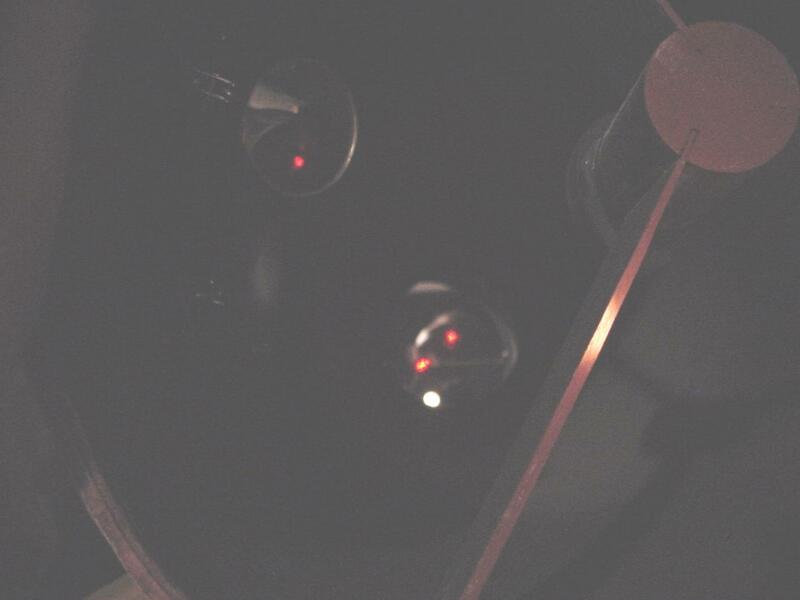 We had noted that after collimation with the laser if we loosened the eyepiece set screw and wiggled the laser in the eyepiece tube the red dot on the primary mirror would jump around about 3 inches. No problem to readjust a Dobson spider but on some scopes readjusting the spider is a major project. 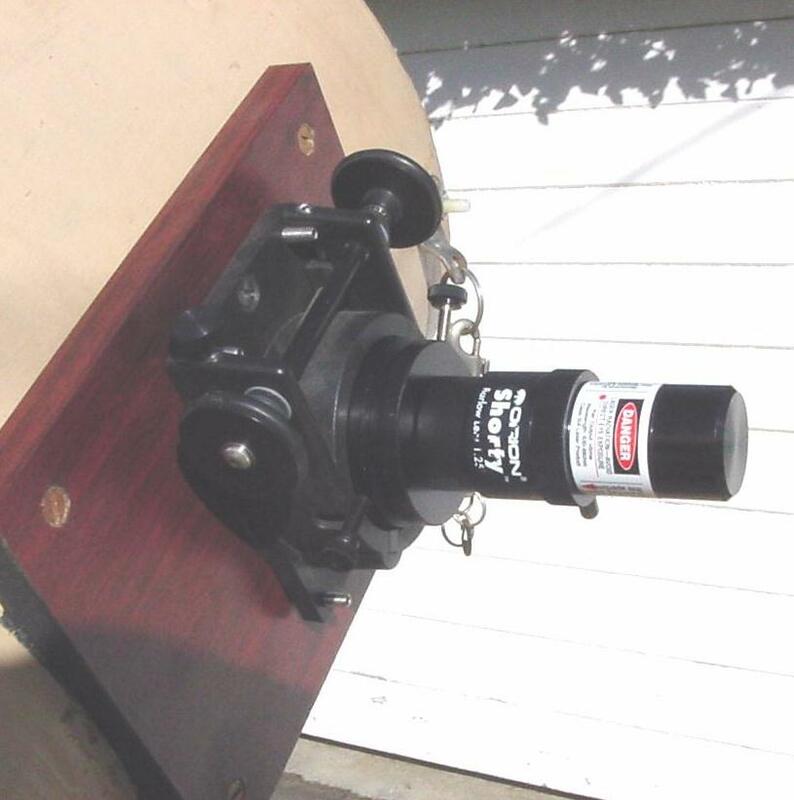 Since we already have a Barlow we decided to try out the setup in the Sky and Telescope article. The only extra thing required is a small screen to stick on the front of the Barlow. After cutting out the poster board circle with scissors we mark the center and cut a small hole with a utility knife to let the laser beam pass. We cut three small squares of double stick rug tape to stick the screen to the Barlow. Now instead of a small spot on the mirror there is a lighted area about the size of a tennis ball. And now even if the lighted area is not centered on the primary center the primary's center is still illuminated. 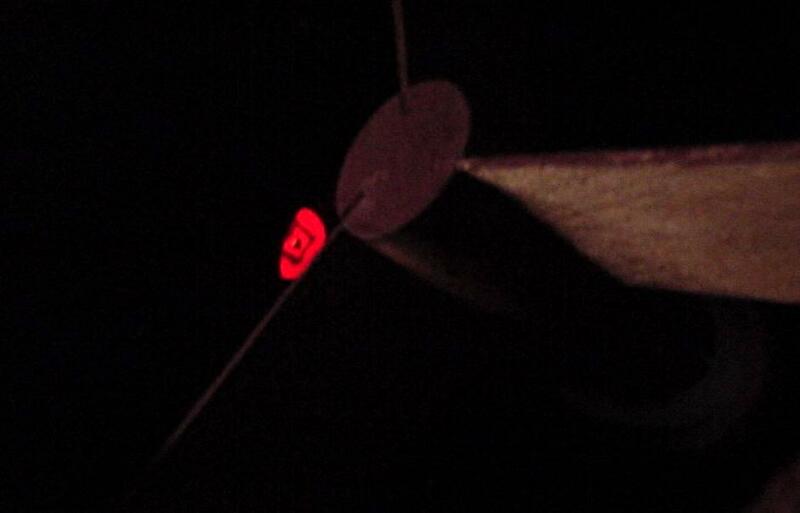 Looking at the screen on the Barlow we see the silhouette of the marking pen square we have put in the primary center. We adjusted the tailgate bolts ever so slightly to move the silhouette to center on the screen. The author of the article says this small adjustment can be important on low F number telescopes.